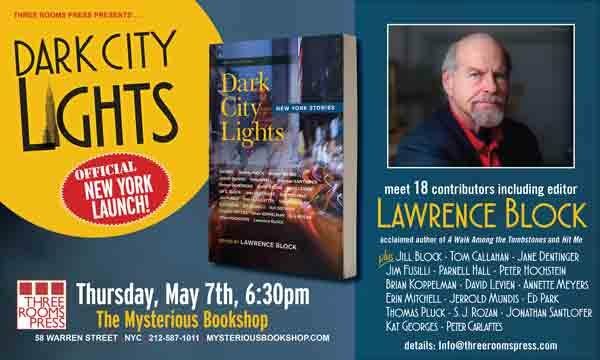 Home→Upcoming Events→May 7: Meet Lawrence Block and 17 authors at Dark City Light Launch! ← NEW DATES ADDED: Michael Fournier’s East Coast Tour!! Join us as we celebrate the release of Dark City Lights, the fourth installment of Three Rooms’ own Have a NYC series! Come on down to Mysterious Bookshop (58 Warren Street in Tribeca, NYC) on Thursday, May 7 at 6:30 p.m. for a night of noir, readings, book signings, and 3RP-style festivities. We’ll be joined by editor Lawrence Block, and other Dark City Lights contributors including Jill Block, Tom Callahan, Jane Dentinger, Jim Fusilli, Parnell Hall, Peter Hochstein, Brian Koppelman, David Levein, Erin Mitchell, Annette Meyers, Jerrold Mundis, Ed Park, Thomas Pluck, SJ Rozan, Jonathan Santlofer, Peter Carlaftes, and Kat Georges. Whew! It’s going to be quite a night, and a rare opportunity to have this collectible anthology signed by so many authors. For more information about the launch, email info@threeroomspress.com or RSVP on Facebook. Read more about this thrilling collection here.